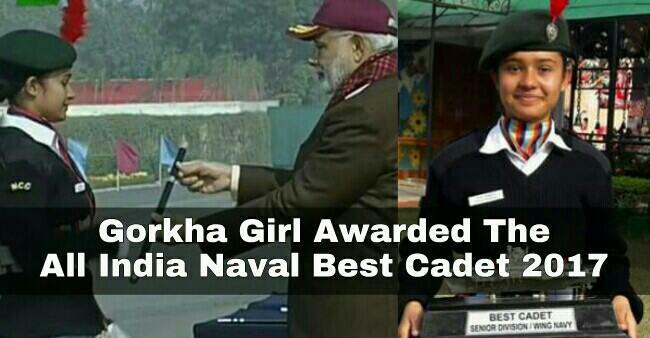 Priya Paudyal, a 21 years old Gorkha Girl from Manipur, was awarded the All India Naval Best Cadet. She was felicitated by the Prime Minister Narendra Modi at PM's rally held at Carriappa Parade Ground Delhi. Born to Mr. Chandraprakash Paudyal and Mrs. Gyaanu Paudyal, Priya Poudel comes from Mantripukhri in Manipur. She is currently studying at the MCM Degree College for Women at Chandigarh, where she is doing B. Sc in Computer science and is presently in the final semester. Priya completed her schooling from the DAV Public School in Manipur, where her hard work and excellent performance earned her a scholarship and hence the opportunity to study at the MCM Degree College for Women at Chandigarh. Priya first joined NCC in her 1st year at the college itself and soon started paving her way smoothly to achieve the Best Naval Cadet this year. After completing her college, Priya wants to dedicate her service towards the country by joining the Defense through CDS (SSB). We are proud of Priya Paudyal for adding to our achievements as a whole. We wish her all the best with all her dreams and aspirations and also hope that she keeps achieving new milestones to inspire us more and more.